Definition: A function $f$ is said to be Increasing on an interval $I$ if for all $m, n \in I$, whenever $m < n$, we have that $f(m) < f(n)$. A function $f$ is said to be Decreasing on an interval $I$ if for all $m, n \in I$, whenever $m < n$, we have that $f(m) > f(n)$. Many texts will give the following similar definition for an increasing function: "A function $f$ is said to be increasing on an interval $I$ if for all $m, n \in I$, whenever $m \leq n$, we have that $f(m) \leq f(n)$", and then define a function $f$ to be strictly increasing on $I$ if it satisfies the original definition above. A similar sentiment holds for decreasing functions. In most applications of the term "increasing function" and "decreasing function", the distinction in these definitions will not be important. When it is, it will be clearly noted. 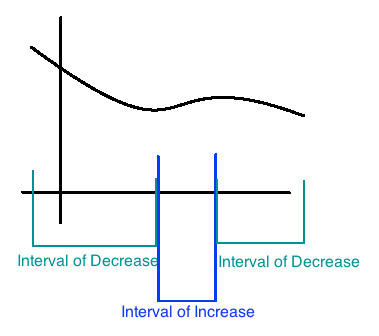 The teal indicates the intervals to where the function is decreasing, while the blue indicates interval to where the function is increasing. Determining whether a function is increasing or decreasing on a certain interval can be difficult if we don't have an idea of what the graph of $f$ looks like. For example, consider the function $f(x) = x^2 - \ln x$. We will show that this function is increasing on $[1, \infty)$. From above we see that $f(n) - f(m) > 0$. So $f(m) < f(n)$ and $f$ is increasing on $[1, \infty)$.